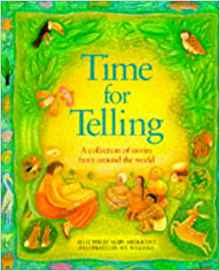 Time for telling: a collection of stories from around the world contains stories from many parts of the world, which have been written down by different storytellers. “Loawnu Mends the Sky” is a Chinese folk tale which has been included. It tells the story of how the stars were formed. Children discover little pieces of sky falling to the ground one day and turn to Loawnu, the wise woman of the village, for help. She asks them to gather up all of the pieces of sky and then she builds a really really really tall ladder and the work begins. This is a very interactive story – children can help with the sounds of the pieces of sky falling to the ground. They can give their ideas on where the pieces of sky are found and on how Loawnu might fix the sky. “The Shepherd’s Dream” is an Irish folktale found in Tales of wisdom and wonder by Hugh Lupton and Niamh Sharkey. Two elderly shepherds sit down to rest after a busy working day. One falls asleep and the other watches as a white butterfly emerges from his sleeping friend’s mouth. He follows the butterfly on a journey down to the stream, over some stepping stones, through the bulrushes and into a horse’s skull. Eventually, the butterfly returns into the mouth of the sleeping shepherd. Can you imagine what the sleeping shepherd dreamt about? He wakes up and reveals all to his friend. 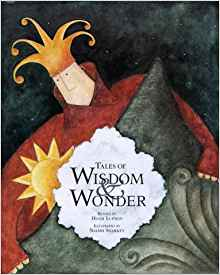 The story finishes by asking which of two shepherds had seen the greatest wonder and this is something that the class could discuss. There are also versions of this story in Scandinavian, English and Icelandic folklore collections. One variation replaces the shepherds with soldiers, changes the colour of the butterfly to a pale blue, and adds some hidden treasure. To read this version, have a look at The storyteller at fault by Dan Yashinsky. Posted on January 25, 2018 by Laura Brett. This entry was posted in Focus on folklore and tagged Folklore, Primary. Bookmark the permalink.